Then God said, "Let us make man in our image, in our likeness…"
The word "God" in Gen 1:26 is translated from "Elohiym" which is plural, and the phrase “in our image" is an accurate translation which is widely accepted as a reference to the Trinity. 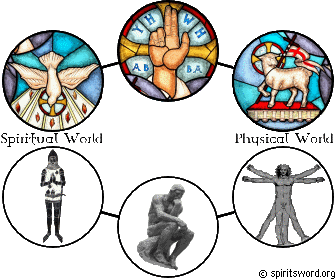 Mankind was made in the image of the Trinity. The Father, Son and Holy Spirit are one God, yet they also exist, to some degree, independently. Many scriptures suggest that the Son and the Holy Spirit defer to God the Father, who is presented as the core and most eminent member of the Trinity. It was the Father who sent the Son and the Holy Spirit (John 8:26-29, 14:26); Jesus as the physical manifestation of God, the Holy Spirit as His spiritual expression. Similar to the Trinity, a man is one person despite having three distinct parts, body, soul and spirit. Your soul is the core of your being, your life. The Greek word for soul "psuche" is often translated as 'life' in English. This is the part of you that will live forever and appears to incorporate almost everything that a person is, your personality, emotions, gender, mind, thoughts, character, conscience, something of your intelligence; and most significantly - at the very heart of the soul - must exist your 'will' (a volitional free will) allowing a meaningful governance of your entire soul, spirit and body. The soul transcends the physical and spiritual worlds but is caught between them. Your soul wrestles to oversee its body and spirit, even as it's constantly subjected to the influence of the flesh on one hand and the appeal of the spirit on the other. Your 'body' is the part of you that is physical, that is made from matter and includes the nervous system and brain but excludes the mind and thought. It's through the body's brain and five senses that your soul communicates with and experiences the physical world. Your body is the physical expression of who you are. In a similar way, Jesus is the physical expression of God. John 14:9 talks of this, saying: “Anyone who has seen me has seen the Father". The body covers the soul, yet it's able to express the personality and attitude of the soul within. Your 'spirit' is that part of you that interacts with the spiritual realm. In I Thes. 5:23, the word 'spirit' comes from the Greek word "pneuma" which is often translated as "ghost". Your spirit is a spiritual 'body' so has senses which can hear, see and feel things in the spirit world. The spirit is to the spiritual realm what the body is to the physical world, able to receive and transmit information in its realm. A person even has the ability to pray and sing with their spirit (1Cor.14:2, 15); and it is through your spirit that the Holy Spirit communicates with you. The word 'heart' is best understood as a broader term that refers to the 'inner man' and usually indicates the soul but can also include the spirit. As flesh covers bones and bones cover marrow, our bodies contain our souls and our souls contain our spirits. In one sense, your spirit is the innermost part of your being but your soul is the core, touching both the flesh and the spirit. Spend some time in prayer, and pray that you would become more aware and more sensitive to God's communication with your spirit.